Originally formed in 2001, The Cosmic Brotherhood of Ra set out to continue the journey begun by pioneering space rock bands such as Hawkwind, Amon Düül II combined with not just a sense of spirituality but also a sense of humour and a debt to the great cosmic free jazz players like Sun Ra and Pharaoh Sanders. Having already shared the stage with greats like Nik Turner, Blue Ôyster Cult, and UFO before they even had released their first CD, it was clear that this band had something special going on. The current line-up of Brother Anubis Re on saxophones, keyboards and vocals, Troy Deangelis on drums and percussion, Brian Kowalski on bass and flute, Dustin Kreidler on guitar and sax, and John Farely on guitar gelled in February of 2005, quickly setting to work on recording their debut CD, Rendezvous With the Living Wisdom. Set for release on the Winter Soltice of December 21st, this one should take the space rock world by storm. We here at Aural Innovations are quite pleased to have a pre-release review of the new CD and to get a chance to rap with the band members to find out just what makes The Cosmic Brotherhood of Ra tick. The Cosmic Brotherhood of Ra - "Rendezvous With the Living Wisdom"
If there's one thing that sets The Cosmic Brotherhood of Ra apart from many other contemporary space rock outfits, it's the strong backbone of free jazz in their music, much like the element Nik Turner added to the early Hawkwind recordings or the kind of stuff heard from Gong in their hey day. But the New Jersey space rock outfit is by no means a Hawkwind or Gong clone. To be sure, you can hear those influences, but liberally spice them with the cosmic jazz of Sun Ra, and throw in dashes of the psychedelic weirdness of early Pink Floyd and the heavy fuzz guitar riffing of Black Sabbath as well. It's a potent brew. Things kick off with a dash of that wild free jazz in 1st Rendezvous (there are bits and pieces of Rendezvous scattered through out the album adding everything from horn torture to haunting, late night space jazz). The rest of the album is a crazy journey, starting with two terrific instrumentals, the anthemic jazz-rock rush of The Halls of Amenti and the weirdly cosmic power stomp of Seeming Isness of the Was. They're followed by one of my favourite tracks on the album, the swirling 8 ½-minute space rock epic Children of the Rose, which captures numerous different moods as it tells its strange story. 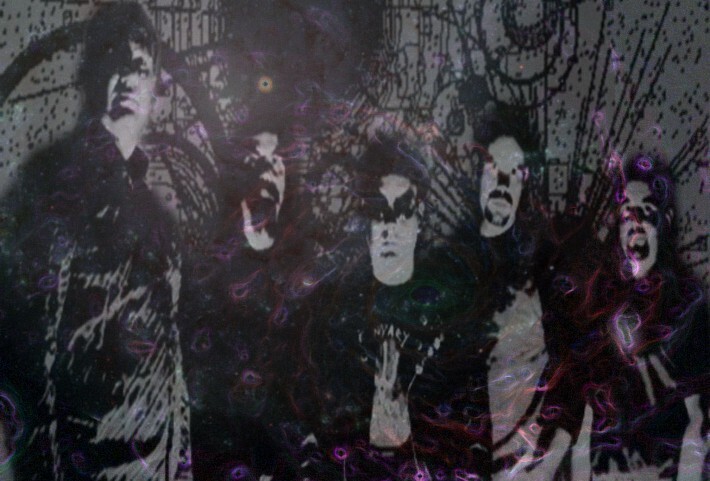 In fact, the album is solid from start to finish, whether the band is playing pounding organ-heavy space funk like The Bees Knees; doing some tribal cosmic grooving like they do on Wearing a Bamboo Suit in a Forest of Pandas; or just playing flat out great, hook-laden space rock tunes like Ride the Comet or the seriously infectious Space Dragon. With the guitars on overdrive, the synths bubbling away, the saxophones blaring, and the rhythm section grooving like there's no tomorrow, Rendezvous With the Living Wisdom packs a solid space rock punch. Highly recommended! Aural Innovations (AI): How did Cosmic Brotherhood of Ra get started? John Farley: As all things start, with bourbon and Quaaludes. AI: You had a number of musicians come and go until the current line-up was finally in place. How has the band's sound changed since it's beginning compared to what you guys are doing now? Brother Anubis Re: The beginning was essentially a Hawkwind/Nik Turner Cover Band with a few Three Chord originals thrown in for good measure...LOL...Eventually, we recorded the first version of "Halls of Amenti" which though it sounded like it could have come off of the Nik Turner "Sphinx" CD, was a step in the right direction for the Brotherhood in terms of writing original material. After that, I stopped trying to be Nik and started being myself... Soon I was writing songs that really started reflecting my Spiritual background in Thelema and Paganism and while the music still retained a "Rock" feel, it was moving slightly away from "Space Rock" and more toward a sort of unpredictable Rock and Roll Stew that included everything from Space Rock to Kraut Rock to Funk and beyond...Eventually once the pieces of the puzzle came together and I got John Farley, Brian Kowalski, Dustin Kriedler (Back in the band after a leave of absence so he remembers the early days) and finally Troy Deangelis on Drums...I realized that I was working with a group of guys that shared a ton of common interests so it only seemed natural to start working in the Free Jazz, the Frank Zappa, etc...and not try to contain ourselves in the Space Rock genre...I mean between the five of us there is a huge amount of musical ground that is covered with enough overlap that it really just works. Dustin: At the very beginning, the band was very hard rock based. I always described it as ZZ Top meets Lost in Space, in that we had a very definite style in which we played just about everything, with the addition of the 'spacey' theremin and keyboard textures. With each line-up change, the band became more and more diverse in terms of skills and interests. As we grew more sure of ourselves and our bandmates, we were ever more able to explore the edges of what we were comfortable with, both stylistically as a band, but also in terms of individual performances. John Farley: The sound changes weekly. AI: What attracts you to the Egyptian mythos? Brother Anubis Re: This is completely spiritual for me...When I really began to practice Paganism, I felt very attracted to Isis and kind of made her the center of my spiritual focus...I also found myself attracted to the God Anubis and the Mythos of the Jackal....It was just something that called to me so I made it a part of the overall scope of the band. Add to that my love of Sun Ra and his teachings and there you have it. Dustin: They built the pyramids and the sphinx, and still no one knows how. Is there much more reason to be interested? Beyond that, their civilization has acted as a sort of blueprint for everyone who followed. You can literally follow their growth from a simple agrarian society into this massive empire, and then crumble away, eaten from the inside by the same forces that destroyed the Greeks, Rome, and every society since, including our own. Brian: Domestication of cats and invention of beer. John Farley: Astroglide. No, wait, that's Greek mythology! AI: One of the things that sets you guys apart from other modern space rock bands is that free jazz influence that was so much a part of the early space rock sound, like Pink Floyd's Interstellar Overdrive and the kind of thing Nik Turner was doing with Hawkwind. Is this a conscious effort, or something that has just come as a result of your various musical backgrounds? Brother Anubis Re: No, this was a very conscious effort as I have always loved Free Jazz...Coltrane, Ayler, Pharoah Sanders...they spoke to me on a musical level and I always admired the amount of spirituality that they poured into their music. I also to this day find Free Jazz to be more Punk Rock than what masquerades as Punk Rock these days...I mean take it back to bands like MC5 who were influenced by Sun Ra...I related to Nik very much because I was a Sax Player first and foremost....Eventually I fronted this band, but before that I was more of a side man and was blowing Free Jazz style solos and wearing Makeup in the Ska Band that I was in (much to the displeasure and confusion of many fans I might add) Again, once I began working with musicians who really understood the Free Jazz thing, it seemed natural to let that influence start shining through in the sound of the band. Dustin: With this line-up, we finally have 5 guys who are all ready willing and able to improvise in real time, from any starting point, with or without a fixed goal. What makes it interesting is our various backgrounds, and the arcs we took to get to this point. For me, I studied classical and jazz saxophone through college, and taught myself guitar. Stylistically, I've been influenced by everyone from John Coltrane, John Cage, John Zorn, to the Beatles. It comes naturally to play a 'song,' followed by a free jazz 'freak-out.' And hopefully it keeps the audience interested, too. Brian: Its no accident for me. I love the free jazz influence on 60's and 70's rock, and spend a lot of time listening t to John Coltrane, Pharaoh Sanders and Ornette Coleman. John Farley: I think that jazz is such an important part of our individual and collective backgrounds that we couldn't leave it out. It's not something we discussed like, "OK, now we're a rock band that layers free jazz over top." It was more organic-- "That's a great rock riff! Here's a little jazz noise to hopefully split the listener's skull. Leave them limp and confused." That sort of thing. AI: Free jazz is more than just an influence, isn't it? Some of the members of The Brotherhood are also in a free jazz band called The Tone Scientists. How did that come about? John Farley: Again, bourbon and Quaaludes. Brother Anubis Re: There is a band called the Tone Scientists who do indeed play Free Jazz, but they also do a fair amount of dabbling in Kraut Rock, Space Rock and Experimental Music as well...The Membership of the Tone Scientists is kept very Secret and changes as needed to suit the situation. The project came about because there is a fair amount of material that was written that is improvisational in nature and did not fit in with some of the more conceptual things that the Brotherhood was doing. The Brotherhood is at the core, a Rock Band and though we do incorporate a fair amount of improvisation into our set there is still a structure and reason for doing things in the order that we do them. The Tone Scientists is an outlet for certain people. Dustin: Brother Anubis Re can probably answer this best, but there were actually two (to my knowledge) main reasons to start the Tone Scientists. First, artistically, there are always a lot of things we want to do, but which may not fit into a CBR set, or which we'd really like to stretch out on, and we don't get sets long enough yet. Also, we're all adults, with jobs, families, and responsibilities. Sometimes there are gigs we can't all make it to, and this allows us to play as the Tone Scientists, so no one feels cheated at coming out to see CBR, and one of us is missing. AI: You describe your sound on your web site as early Pink Floyd meets Sun Ra, and also of course reference Hawkwind. Now Pink Floyd is, of course, a pretty big name, and not too hard to discover by aspiring young musicians, but how about your more esoteric influences? I'm always interested in how people discover music like Hawkwind and Sun Ra. Dustin: I had once worked on a stage crew for a Sun Ra Orchestra performance in NYC, which blew my mind. My first introduction to Hawkwind came through Nik Turner's Space Ritual, which Brother Anubis Re turned me onto when he was first starting the Cosmics. Brian: Ten years ago an old friend of mine who shared my love of Alice Cooper and Deep Purple told me Hawkwind was one of his favorite bands. When I saw the cover of Space Ritual I had to hear it. I've been collecting ever since. Brian Ritche turned me on to Sun Ra. John Farley: A kind soul gave me a copy of John Zorn's Naked City when I was about 15 or 16. I sat and listened to the tape and nearly passed out. Listening to these insane musicians leap from blues to rock to country to psychedelic jazz freak-outs in only a few measures left me numb and desperate for more. From that moment, I realized that there was far more to music than pentatonic scales and power chords. AI: How do you go about writing songs? Do you actually sit down and compose the piece, or do a lot of your songs come initially from just simply improvising? Brother Anubis Re: I don't think that I have ever sat down and composed a piece from start to finish....I write like a Horn Player…I write riffs or hooks...With this line-up there is a fair amount of music that comes out of improvising at rehearsal as well, but most of the time I simply write lyrics and a riff or just a riff and then play it for the guys and they take the ball and run with it. I am not that talented and even when I come up with a Riff on the Keyboard I couldn't tell you the notes or what Key it is in....I kind of just sketch out my own form of Hieroglyphs and then play it for the rest of the band. Our writing really is a group effort and none of us tell the other how to play...I think the reason that we sound the way that we do is for this reason. There are no Rock Stars in this band, and I like it that way. Everyone enjoys working with everyone else and what comes out of our rehearsals is really rewarding and enjoyable. Dustin: The lyrics have so far been Brother Anubis Re's domain (though I did write the international super-hit 'Space Madness!'). As far as writing songs, usually someone will come to rehearsal with a riff, or a chord progression, or some cool chord change, and we'll build it up as a group from there. It's a very communal effort to create a song, which is good. From there, the song can continue to change, as people get tired either of the part they had been playing, or the feel of the song in general. One classic example for us is (And All Our Dreams) Fall Into Sand, which we've been playing at least as long as I've been back in the band. We've changed it so many times I can barely remember what it used to sound like. In the recent past, we changed up the arrangement in the recording studio, then again almost the next week. The recording, which may be on our debut album, has almost nothing to do with the way we play it live now, which I think is great. To quote Ani Difranco: "People used to make records, as in a record of an event. The event of people playing music in a room." That's what the recording of Dreams was...no more, but no less, either. John Farley: After much bourbon and many quaaludes, Troy takes his shorts off and inspires us. Lately, there has been a lot more improv in our writing sessions. Usually, it begins with a riff that someone has been kicking around at home. We'll jam on the riff a few times until everyone writes the part they are comfortable with. It's organic. Everyone is free to put their particular stamp on a track, for good or ill.
AI: Is there much improvising when you're in a live setting? Brother Anubis Re: There is some and things can change on the fly depending on our mood or how much Beer we have had....but for the most part we carefully select the set list in advance and really focus on how we are going to play the songs that night. But... Some of our material was written in a way that it can never be played the same way twice so...You tell me. I am a huge fan of The Legendary Pink Dots and I really enjoy how they take a song and play it differently live...Reinventing it each time they play it. That is how I like to treat our songs. Dustin: Absolutely. There are few things etched in stone, even on the more 'traditional' rock songs. Everything is open to the interpretation of the moment. John Farley: We don't get enough time on stage to improvise the way we want to. Once we start getting 2-3 hour sets, we'll make Grobschnitt look like Oasis. Ok, that may be a bit of an exaggeration. AI: To what extent does the new CD reflect your live performances? Dustin: In that it was done quick and dirty, just like our live shows, it reflects the live show fairly closely. To say there aren't obvious differences would be a lie, but considering the speed with which we tracked the album, it's not like we spent weeks, months, or years crafting a work of art that is completely separate from the live show, or that we needed to figure out how to play live. We pretty much went into the studio knowing exactly what we were going to play where, how, and why. John Farley: The new CD is an homage to the Brotherhood of 6 months ago. I'm not sure it is an accurate depiction of the Brotherhood today. The sound changes weekly. AI: I'm curious about the Space Rock Opera The Chronicles of Baab. What can you tell me about it? John Farley: Grandiose, self-indulgent tripe. A masterpiece! Brother Anubis Re: As a band, we do a lot of things that are very Tongue in Cheek....It's the Zappa influence...or Spinal Tap, can't really figure out which. "The Chronicles of Baab" was something that I came up with that combined several of our songs into one cohesive set and then I wrote a back-story to somehow link it all together. It was only performed once or twice and I would like to do it with this line-up and make it even sillier....as if that is possible. I mean, think about it....I was drinking and listening to Arthur Conley's "Sweet Soul Music" when I took the line "Spotlight on James Brown y'all...he's the King of 'em all y'all" and said aha! I will call my imaginary kingdom "Amallyall" and the "King of Amallyall" will be "King JB". I am obsessed with Soul and Northern Soul by the way but don't tell anyone because I might lose Scene Cred with the Space Rockers...LOL....So the whole back-story of the "Rock Opera" revolves around this kingdom and Baab (my way of taking a common male name and making it look mysterious by changing the spelling...) who was merely me...Why I was trying to take down James Brown I don't know...Yes, a silly and Autobiographical "Rock Opera"...who would have thought? Alice Cooper anyone? So yeah, on paper it looks cool like we are these deep and talented Prog Musicians but in reality...Well, let's end this conversation here. AI: You've played a lot of gigs and festivals through the past year. How do you feel about the current space rock scene in the US? How do audiences react to your particular brand of space rock? Dustin: We actually get a surprisingly strong reaction. I think people are becoming increasingly tired of being bottle fed an endless procession of homogenous pop-rock-rap star-du-jours. The music industry complains about piracy and slowing profits, but they've gone and destroyed the idea of an artist that you could follow for years. It's considered stunning when a band puts out 4-5 albums now. Look back to the 60's and 70's, that was not only common, it was expected for the first decade of a band's existence, not something to be marvelled over. You know why the Stones, Blue Oyster Cult, and Hawkwind are still on the road? Because *someone* has to be, and its the old pros who are still able to get up there and deliver on a regular basis who get called out of retirement to fill in the gap left by the latest rap-metal band that fell apart on their 3rd tour. Not that I'm bitter towards them, at all...seriously. No really, I'm not. Why are you looking at me like that. Stop laughing, goddamit! John Farley: I don't know about the rest of the country, but NJ does not have a space rock crowd. When we do find an audience that gets it, that knows when we're serious, knows when we're having fun, and knows when we're drunk, the response is phenomenal. 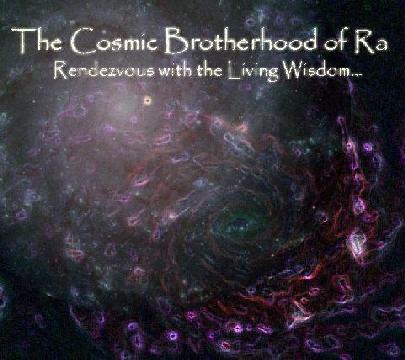 For more information, visit The Cosmic Brotherhood of Ra at their web site at: http://www.cosmicbrotherhoodofra.com.